Check out our amazing Christmas Cantata, "What Kind of Throne" by the choir at South Harriman Baptist Church! Reminder: Christmas Caroling This Wednesday! We will be leaving from the church at 6pm to go caroling and expect to be back at the church to enjoy some hot chocolate and apple cider by 8pm. We will be going Rain or Shine! So join us and dress in layers! Don't Forget: Candlelight Service This Sunday Night! Don't forget to invite your friends and family to a very special night of worship at South Harriman Baptist Church this Sunday evening, December 10th, starting at 6:00 PM. We will have a special time of worship followed by a Christmas Cookie Reception! 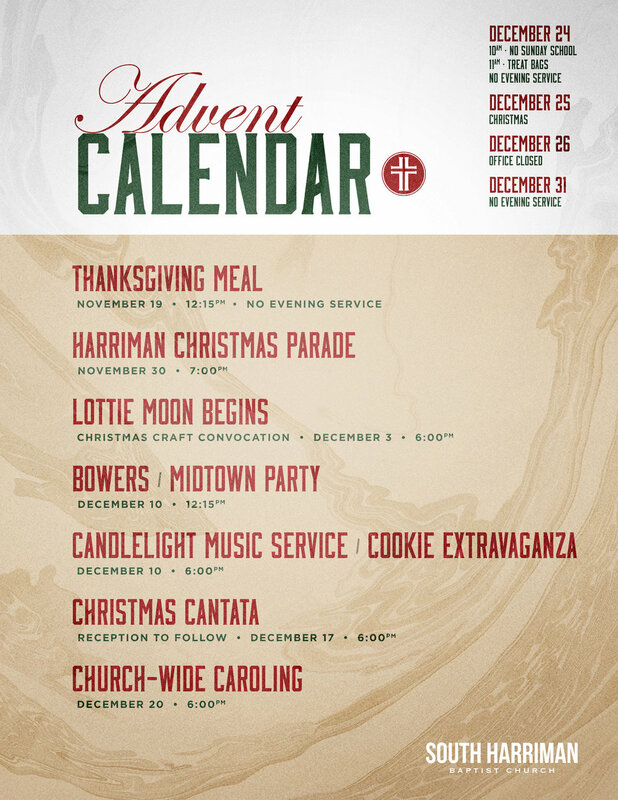 Check Out Our Calendar Of Events As Christmas Approaches! This year's Christmas program, Journey to Bethlehem, proved to be a huge success! None of it would have been possible without our church body's huge effort and generous heart. Thank you for the time, the energy, the discomfort, and the personal items that you lent to make the evening a success. Look below to see some great pictures of the event and to see some of the numbers for how we reached the community with the Good News of Christ's arrival! Over the two nights of the event, nearly 800 people drove through and experienced the Good News of Jesus' Arrival in a whole new way. Your work and dedication (even in the cold) helped to bring our Savior's story to the people of Roane County. Leading up to the event, we reached 18,000 people on Facebook who read about the event and/or watched the live video stream, and people visiting our church website grew by 2806%. Those are no typos! You can still access the recordings from the event on our church Facebook page! Thank you again for your help for this great event. It will be in the memory of the community for years to come and will stick with many individuals their entire lives. To God be the Glory!